I just pruned this topic of some promotional posts. Please keep that stuff off this forum. 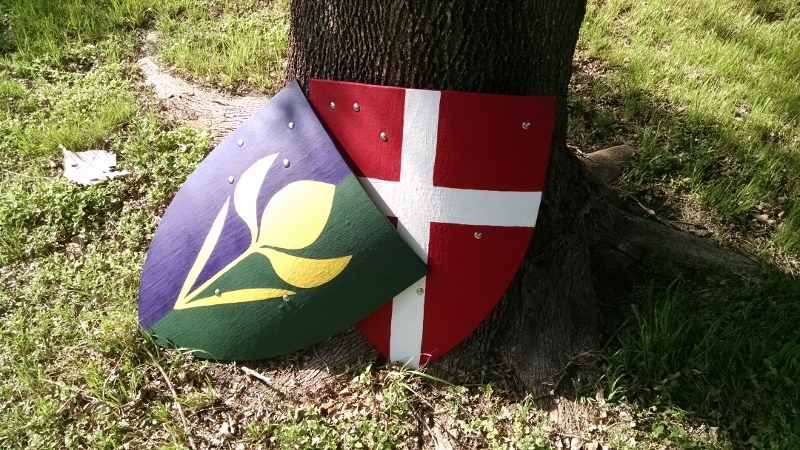 A relative of mine is into larping, so I promised to make something for her. 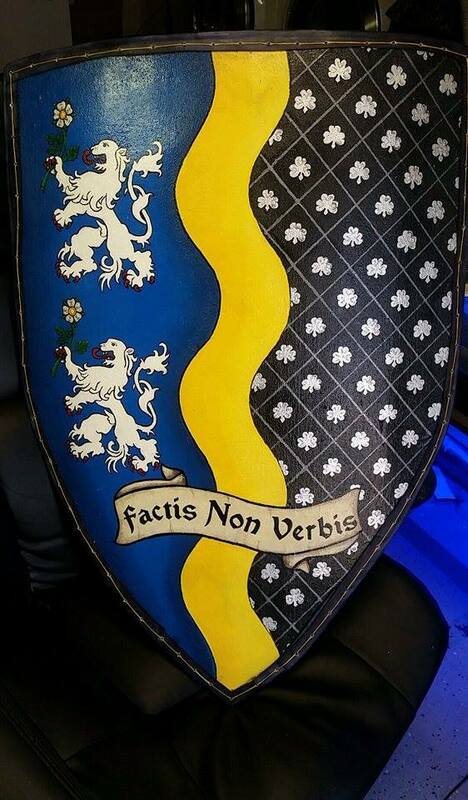 This shield is the result. It's basically an average strapped heater, with a strong curve. Plywood bent to shape, the decals are thick felt, glued and nailed to place and then painted. A fun piece to make, even though it is purely fantasy. 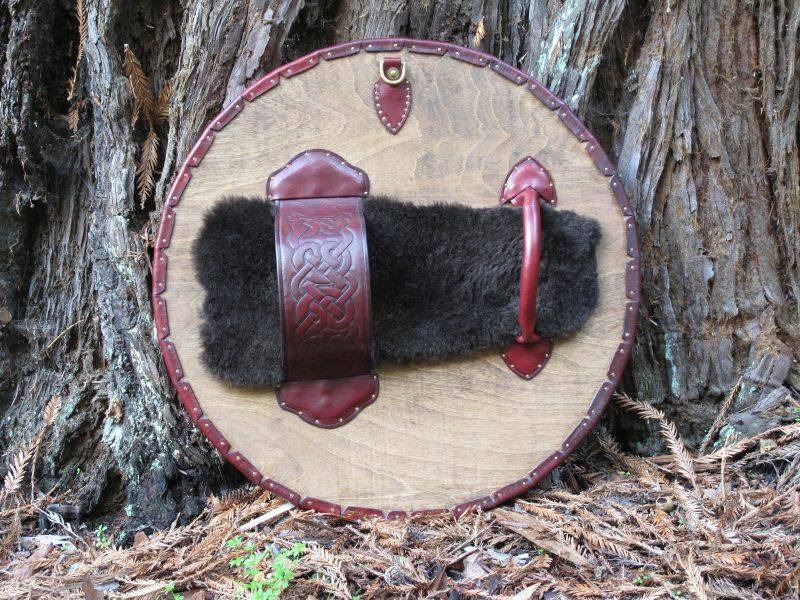 12th century shield for a Norwegian man at arms or lord. Shape based on the Lewis Chess-pieces, the Bayeaux tapestry among others. Colours and design from the Baldishol-tapestry. Here is my faux-pavise. It's compressed plywood sheats and not planks, but the shape is good I think. Covered by several layers of linen and diluted glue. Paintjob and riveting by me. Kinda proud of the outcome of my first Fraktur font paintjob. Could pass as a fieldjob by a hungover foot soldier. Paints are linseed oil and pigment. Here's mine, covered in leather and lacquered with silk on the back. I noticed that the spider emblem on Danny's shield is akin to Venom's, one of Spider-Man's archenemies. 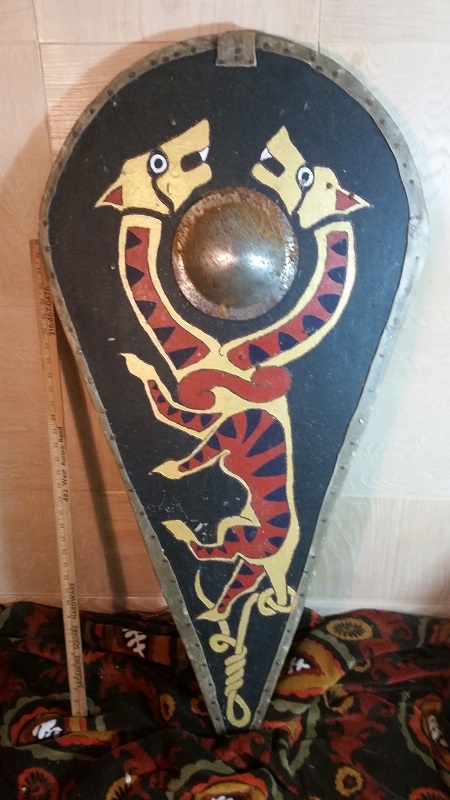 Posted: Mon 16 Nov, 2015 10:34 pm Post subject: Shields! 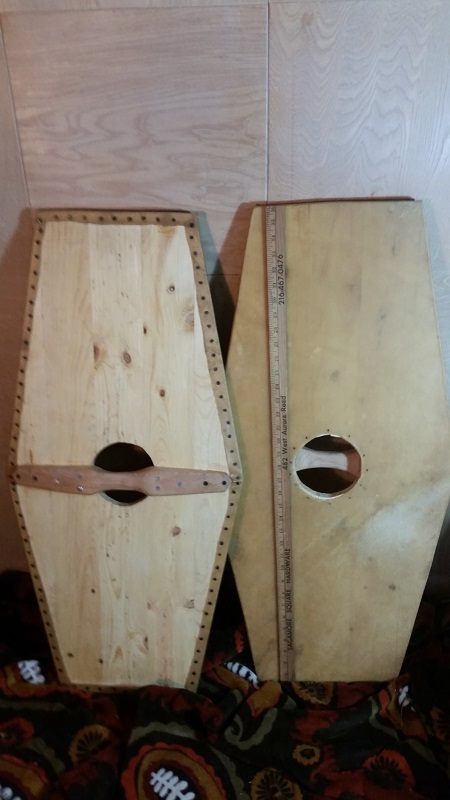 Canvas covered linden boards. Knocked these together over a weekend. 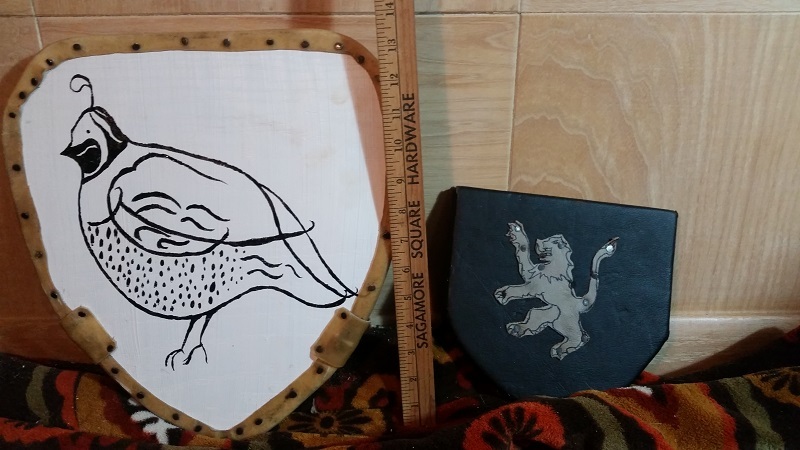 My reconstruction of late 14th/early 15th century shield from the region of medieval Serbia, hope you like it. Made out of laminated wood, bent into shape by press, once dried covered with several layers of linen using sinew glue. Leather straps colored using alcohol based paint to avoid staining on gauntlets when used. 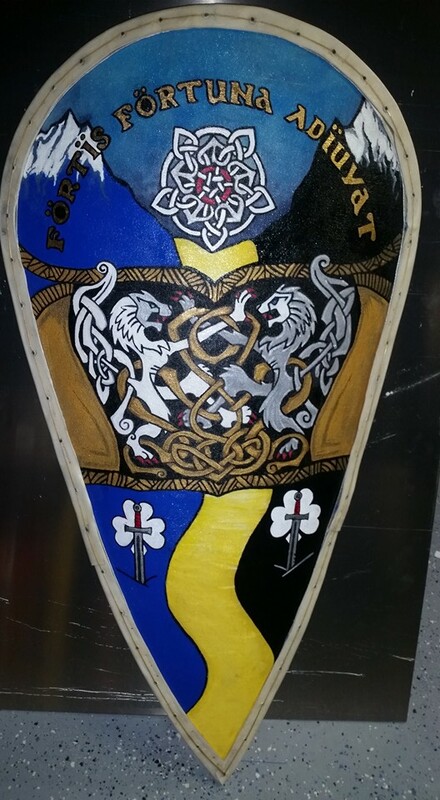 Heraldry is painted with acrylic pigments, using water diluted wood glue as color binding, giving the color very slight gloss. Shield shape is seen in several 14th century Serbian frescoes, as well as Orlando's pillar in Dubrovnik(Ragusa). 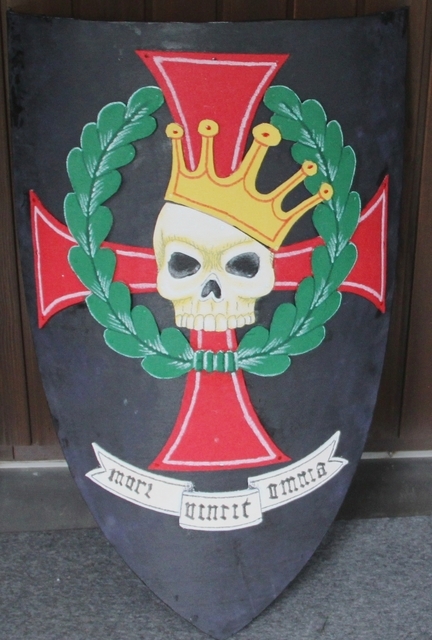 Heraldry is based on 14th century Serbian heraldry as well as same symbols from "stecak" tombstones. Broke in my new shield press with a pair of heater shields. Basic "modern" construction--two pieces of 1/4" plywood glued together over a form to impart a curve. Covered front and back with linen. Painted with acrylics and given a coat of poly. Enarms and guige are leather, held on by carriage bolts, which will make it easier to replace the straps after I finally get some decent buckles. 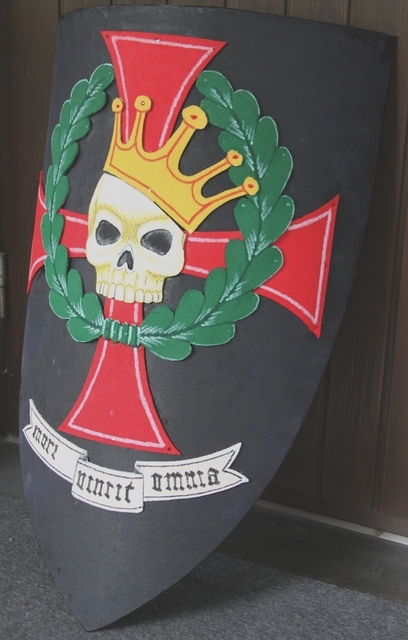 The one, Gules a Cross Argent, is intended for my early-14th century Hospitaller kit as a renfair/costume piece. The other one, Per Pale Purpure and Vert, a Crocus Flower Or, is just for fun, and a symptom of having a wife who loves Disney movies. 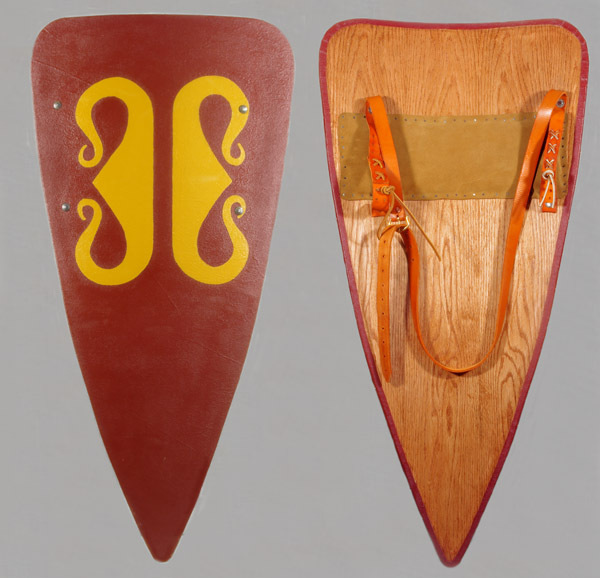 Slowly putting together a kit... Late 12th C flat-topped kite shield. Sort of historical, based on Rolandslied of Konrad Pfaffe, AD 1180-1200. I like the wood, so I left the back uncovered. Actual colors are a bit duller than in the photo, tried to recreate an ochre palette. 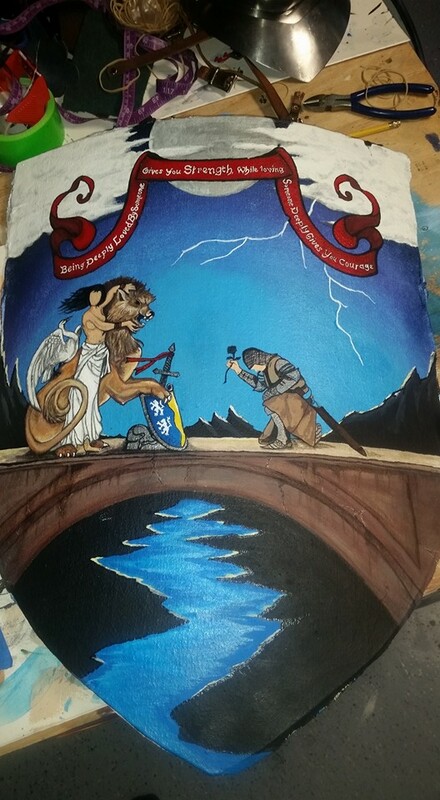 The size is as accurate as I can get it - 20 x 40 inches - based on measurements and shield-to-body proportions from illuminated manuscripts.I covered the shield in canvas instead of leather. 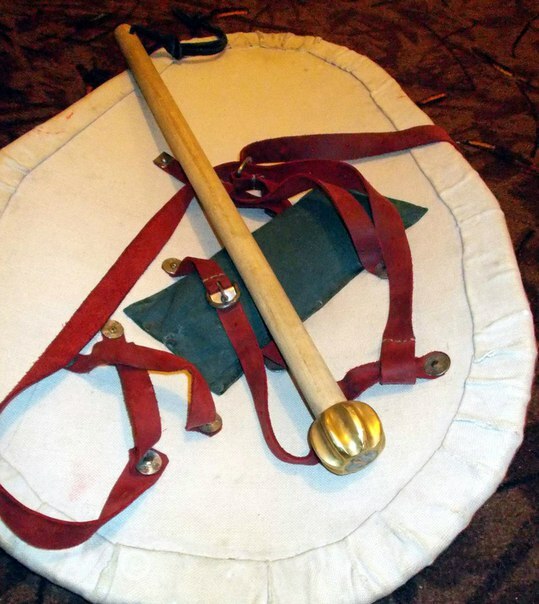 I use leather only on my fighting shields, and this one is for show. It gets expensive covering shields with leather, even if it is only 1-2 oz. pigskin. Sublime, Harry. 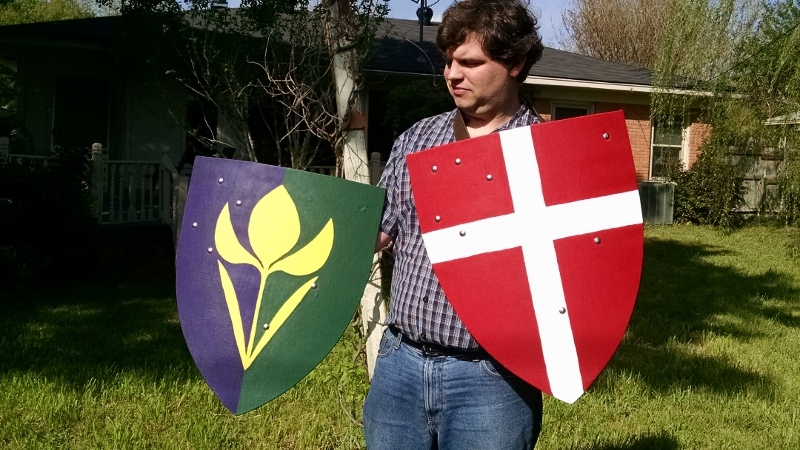 This is precisely the kind of shield I'd like to reproduce- the two models I'd want to work from are either the Rolandslied or Hortus Deliciarum. 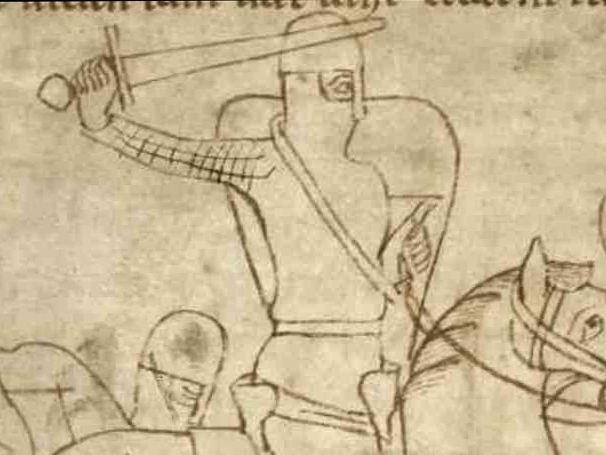 I love that you've captured the narrow, tapering shape of these shields, which very few makers seem to create, and that you've elected to have horizontal strapping only- another feature commonly seen in the manuscripts. 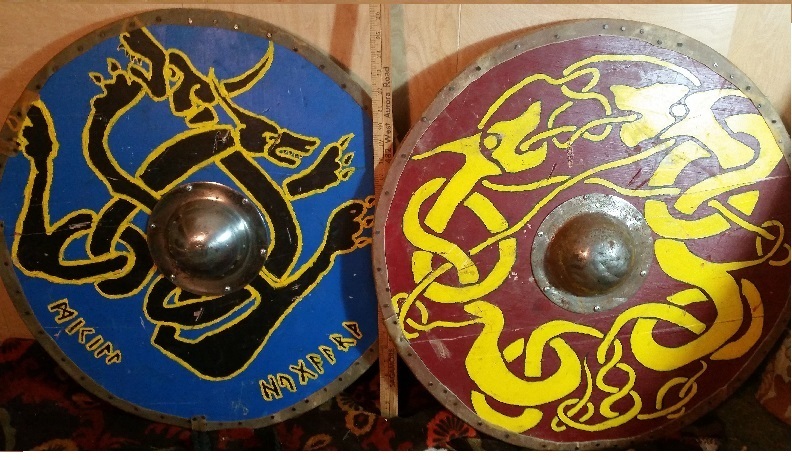 Here are the shields in my collection. 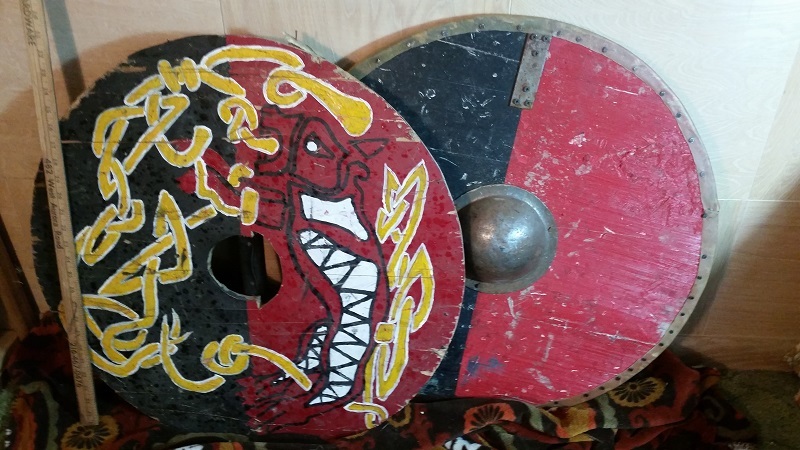 Most of them are self explanatory, the round shields are maple rimmed with rawhide, except for the yellow with green snake, which is the end of an oaken barrel. 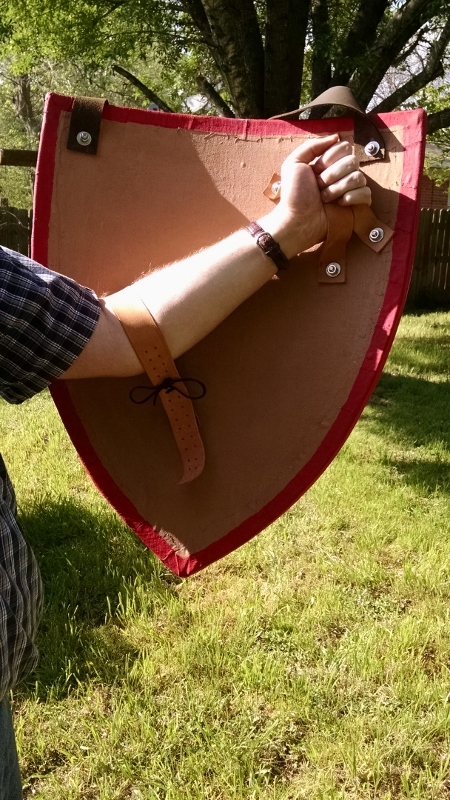 It is ridiculously heavy and is used as a "training shield". 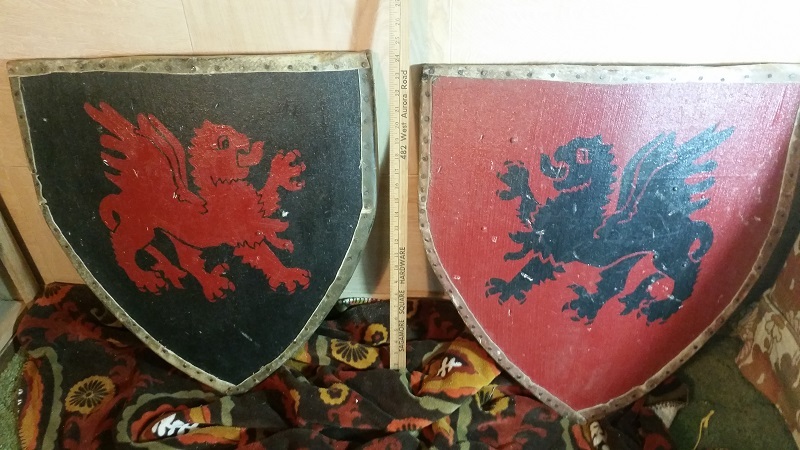 The hexagonal Germanic shields are unfinished as of now, pine with a rawhide face, and will be painted soon, but I lack the funds for the umbos, so that project is on hold for now. The small ones are for my two daughters, 5 and 2. 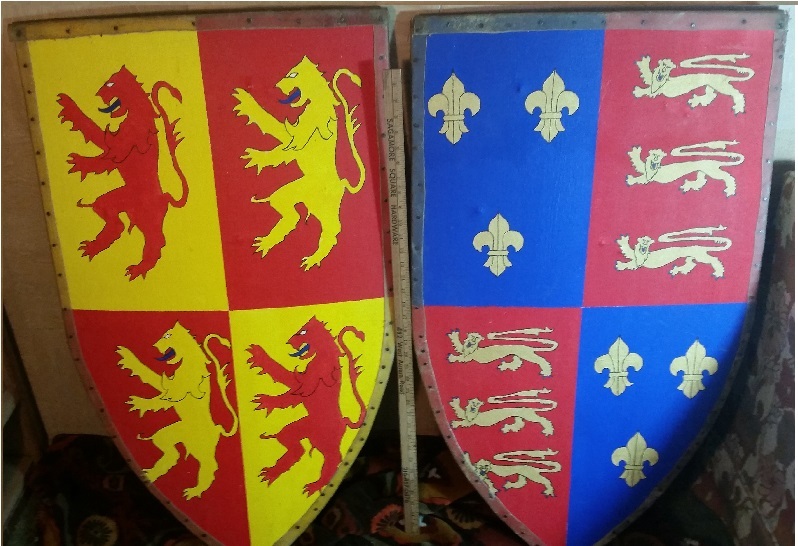 The tall heater shields are painted with the arms of Oain Glyndwyr and the English crown at the time of the Welsh revolution. All of the curved shields are bent plywood faced with canvas and edged with rawhide. I made all of these in my spare time, and most of them have been seriously put through their paces. I have been fairly happy with their performance but am very excited to use the hex shields, they seem very fun. Paul there's a lot of work there! I really like your kite shield. 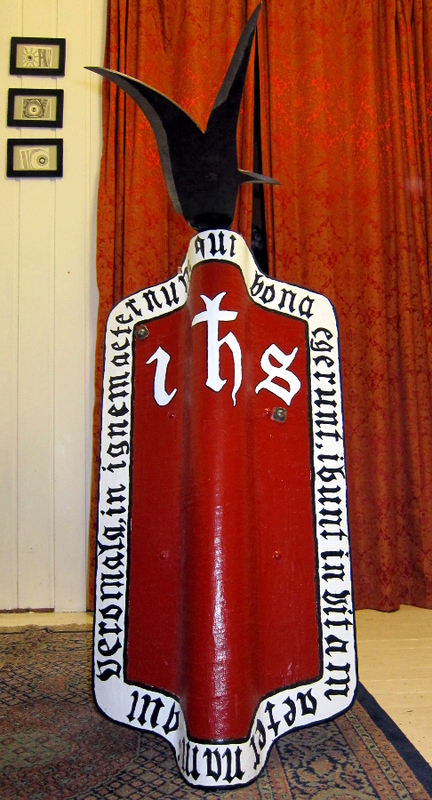 I would recommend putting a cover over the back as well, as all existing high medieval shields have. Whether or not you are actually using parchment and planks, the concept remains that a covering will prevent splintering and fracturing or the blank. It will simply look more historical and - if your construction methods are correct - function that way as well. I know.... but I chose not to do so, that's why I wrote that my shield was "sort of historical...."
So i ran across this thread looking some some late period German armor. So i figured i would post my last months work and work in progress. The kite is a play on my SCA device with a mix of my Lady's heraldry. The Heater is a version 2 of my device and the final heater is a work in progress based on the Tarot Card- Strength. 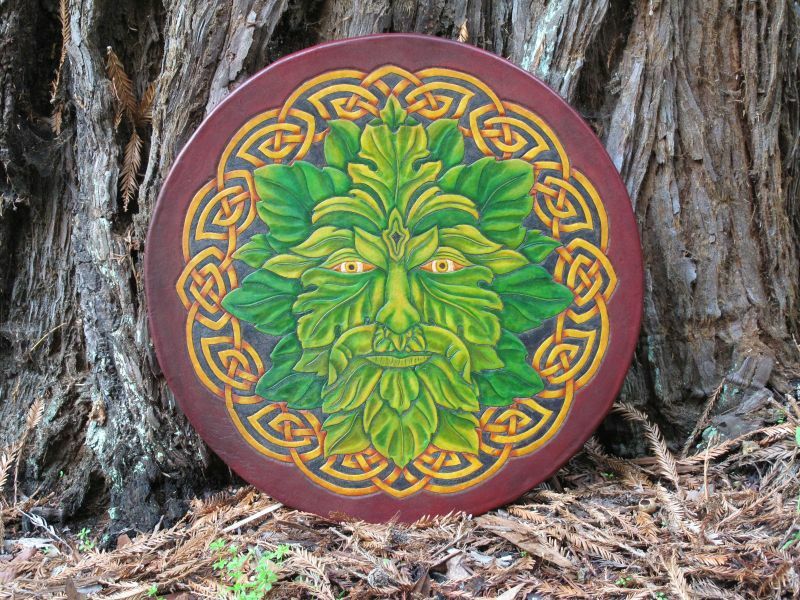 Recently completed Targe with a contemporary Green Man design. 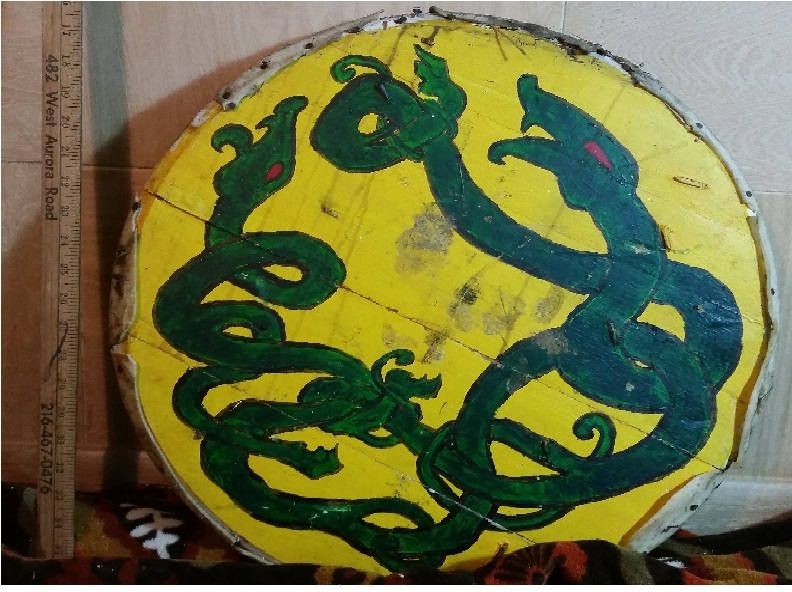 20" diameter birch plywood base with 4oz hand carved/tooled design. Sheep shearling padding on back.